I’ve had this set of cookies in my head for quite a few months. I had no idea how I wanted to do them but knew that they would be something I do for Valentine’s Day. 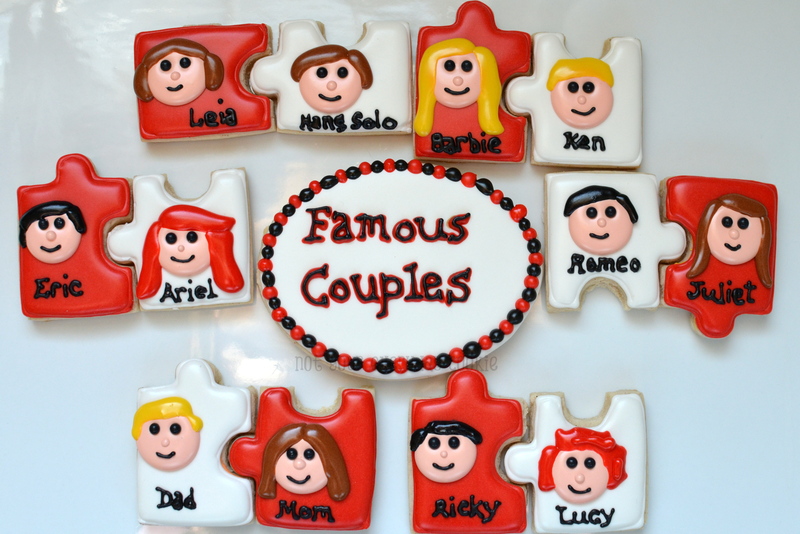 Then I heard that Melissa from Simply Sweets by Honeybee and Stephanie from Ellie’s Bites Decorated Cookie had a “Famous Couples” challenge for February and decided to put my thoughts into this set of cookies…finally. Love these Lene! Great idea using the puzzle pieces…puzzle pieces ROCK! You are the BOMB Lene! This is such a unique idea. I love how you look for ways to get the kids involved. You’re a cool mom! Thanks for participating in the challenge. Thanks Melissa! The challenge was so fun…why did it take me so long to play along? ?